Köfte is one of the first things that most people would think of when thinking about Turkish food. At least, I assume so. We couldn't possibly leave it out when selecting our Turkish dishes to make, could we? 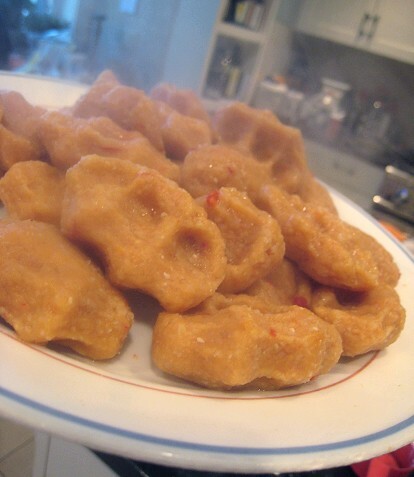 As I was browsing for Turkish recipes, I saw these garlicky bulgur buttons. They are quite adorable! However, for some reason or another, they seemed like they took "a lot" of work (for lazy us). So, somehow, we ended up choosing to make Çılbak Köfte, or "poor man's kofte." They are so called for having no meat in them at all. I don't know if they were actually less work or not. To prepare for our Turkish food spree, I drained a couple of tubs of yogurt. Good thing, as I needed some for this dish. But we'll get to that later. 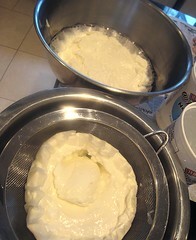 I started making the "kofte" first. 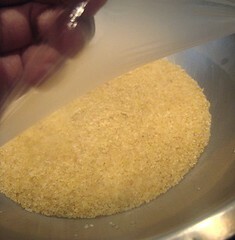 I let some bulgur soak with hot water for about 10 minutes. 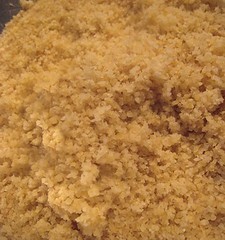 Then, I started "kneading" and mashing the bulgur. 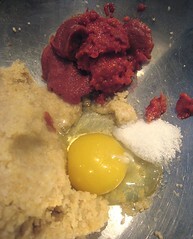 I added egg, salt, tomato paste and red pepper paste (as seen here and here) and mixed it together. 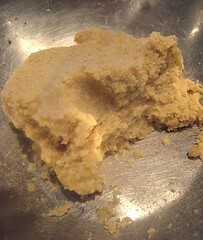 I started adding the flour slowly and "kneaded" the mixture until it all came together. Then, I started shaping them. 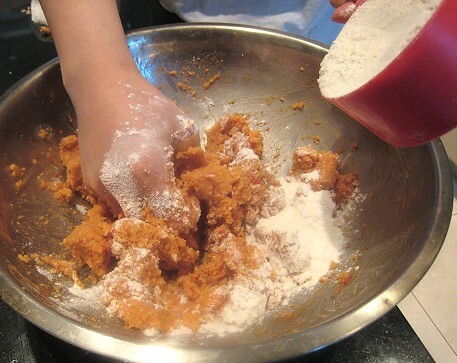 Basically, you take a small amount of the "dough", roll it into a ball, then squeeze a ball in your palm, making grooves with your fingers. To cook, they were simply dropped into boiling water until they floated back up. A plate of just-cooked steaming bulgur kofte! To dress them up, we made a garlicky yogurt sauce: yogurt, minced garlic and salt. We also made "sizzling paprika", as per the recipe. 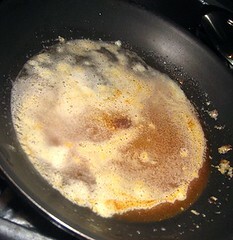 We simply melted some butter in a pan with olive oil, then added some Hungarian paprika until sizzling. 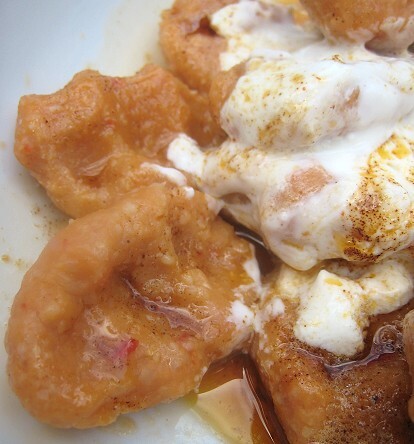 The two sauces were then poured over the bulgur kofte. I found the bulgur kofte not so much like meatballs but rather like gnocchi in presentation. They were not pillowy-soft like the best of gnocchi, however, but were kind of dense and al dente. I liked the chewiness of them, though. Tastewise, they were a tad bland and could have used more seasoning, with just a hint of sweetness from the bulgur. Perhaps we should have added more garlic to them for that kick. As an alternative way of serving them, we tried sautéing them in the paprika butter. I preferred the sautéed version because they had more flavour that way. 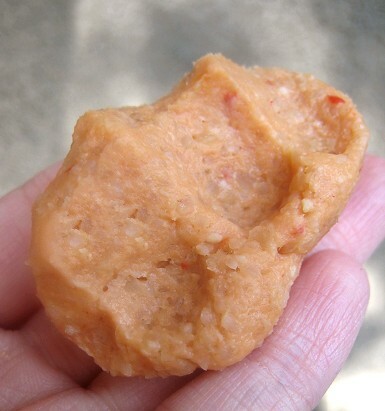 I personally like anything with this type of chewy texture (rice cakes, anyone? ), so biting into these was a treat. I think they do need to be treated as "pasta", so the sauce is an important component to the dish. 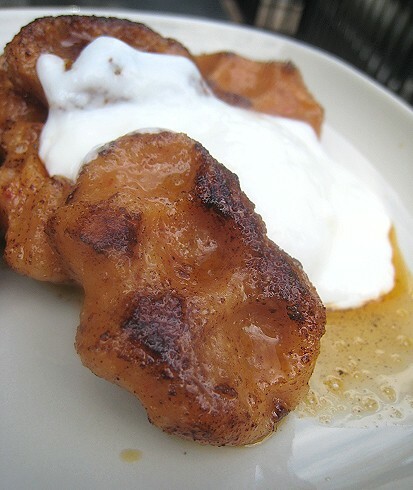 The recipe at Almost Turkish Recipes suggested a number of different sauces, including a "sour" one (originally posted with her Bulgur Buttons recipe). So, next time, I think I would try that sauce. These kofte were the very first thing we made, so it made for great snacking while we prepared the other dishes. 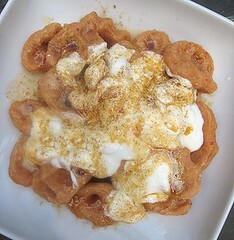 This looks so delicious and now I'm craving Turkish food!